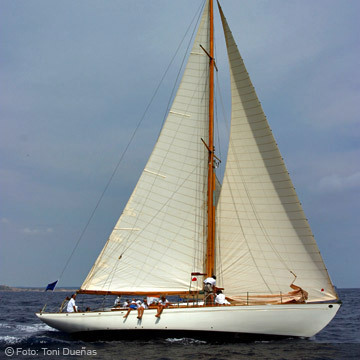 It was designed by Sam Crocker and built in 1938 in the Simms Bros shipyards, in Dorchester, Masachusetts, for J. J. Storrow. Sam Crocker has designed some of the most excellent classic yachts. Disciple of the famous navy architect John Alden won and envious reputation, developing a unique style. Among all his designs (191) the Mercury stands out, being maybe one of his best projects according to Joel White, a prestigious designer of the yachts W Class (spirit of tradition). The yacht was made to sail in New England and the Bermuda’s islands. It had the same owner for the first 30 years, to be later owned by many different people who moved it from one place to another along the East Coast of the USA. It finally crossed the Atlantic and arrived to England, where it spent some years, and after that, it sailed to the Spanish coast to finally arrive to Mallorca. Jordi Cabau, current owner of the Mercury, says that when he first saw the yacht was in Pollensa. He had been looking for a classic boat for many years, and at that moment the Mercury was about to be launched. It was “love at first sight”: he was captivated by its lines and immediately knew that the Mercury was the boat he had been waiting for. He finally bought it and became its seventh owner. At that moment the Mercury had been flagged in Spain and re-baptized as “Spanish Lady”, but Cabau was determined to change that name for the original one. “All the information I gathered of the yacht, I got it under the name of Mercury. It was built with that name, and that’s how it will be called as long as I’m the owner”. The hull of the Mercury is double, made of mahogany in its outside and made of cedar in its inside, screwed on American oak frames. The beams are made of oak and it’s where the deck (made of Teak of Honduras) is supported. The mast and the boom are made of Spruce. On its outside, the boat looked great because it’s maintenance had been great (well painted and treated). The most serious problems were in its inner part, structure and facilities. I looked for a caulker, and that’s when I met Mateo Grimalt, who was going to be the artisan responsible for the yacht’s splendour comeback. We hoisted the Mercury from the water for its preparation. The mast and the boom were removed from the boat, and all the bronze ironwork, candlesticks, porthole windows, etc. were also removed to be polished and saved. This restoration has been possible thanks to the team we’ve formed, the owner, caulkers and others, creating an awesome working mood and environment to reach the shared goal. I want to mention for their love and sacrifice for the work (apart from Mateo), Siso and Javier, because we’ve lived all the restoration phases together. As an anecdote, I’ll say a legend, anciently, when a boat was being built, a gold coin was placed in it to give the boat good luck. From the beginning and as the boat was being dismantled, we commented that very little remained and the coin still hadn’t appeared. One day, while fixing the mast, I saw a metallic object with the shape of a coin located at the height of the first crossarm. At the first moment, and because it was covered with varnish, I thought it was a little metallic cover. But when we scratched it, we saw it was a golden sun, coin from Peru Republic. So the legend was true!